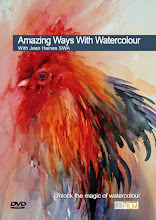 Cover of my book " How to Paint Colour and Light in Watercolour "
On show for the first time. My next exhibition will take place at The Market Street Gallery, Alton, Hampshire. 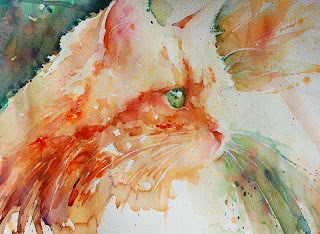 In the collection will be favourite paintings including work from my first book "How to Paint Colour and Light in Watercolour"
The cover " Beauty Of Venice " will be on show for the first time and the collection will include many paintings which are my personal favourites such as this gorgeous cat with green eyes. It is going to be very hard letting this piece go as it will be on show for the first time in the exhibition. The Market Street Gallery has hosted several events for me watching my personal growth as a professional artist over the last few years. 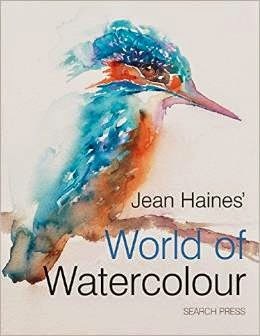 I had work accepted into the Royal Institute of Watercolours during my first show there and have become a full member of the Society of Women Artists since then. My style has evolved and reputation as an artist grown as has the popularity of my watercolours. It gives me great pleasure to return with a few surprises because as always in my exhibitions there is an element of the unexpected. Everyone wants to see cockerels and racing scenes. Will there be any in this next show? But it will definitely be fantastic. A preview will be arranged as a " Meet the Artist" evening and I would love to see you there. For full details please contact the Market Street Gallery directly. The last few months have been so busy and my Summer has been full of exciting opportunities. 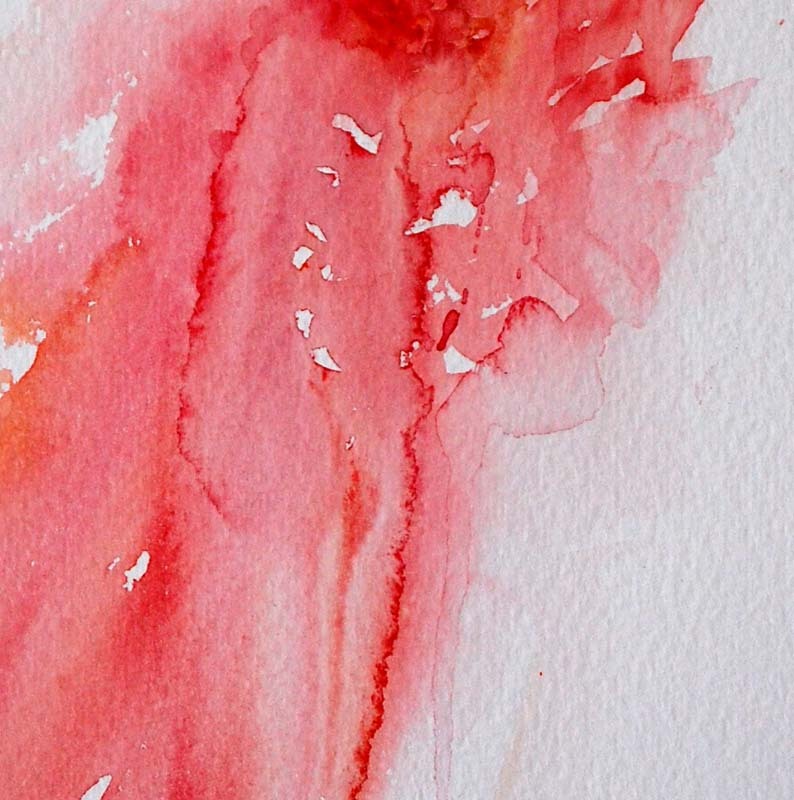 My life is changing as my time is now taken up because of my devotion to watercolour. And in so many ways. Writing is obviously a passion of mine as well as working in this medium so the new opportunities that have come my way involving writing art magazine features along with my first and next book have been really thrilling. Having work in established galleries who exhibit favourite subjects in the right surroundings is also an incredible and vital part of my art career. I have made a decision that will see my workshops for 2011 limited in number but more adventurous and inspirational than ever before. Mainly because my own excitement with this magical medium has built to a level that is at an all time high. I also have a new location that is really going to be wonderful for artists coming to me from abroad. I have the opportunity to hold a workshop in Canada in the fall next year as well as exhibit there. I am being approached constantly regarding my art in so many ways but what is the most vital and key factor of my life is that whatever happens, I never want to lose my enthusiasm and love for moving my brush. 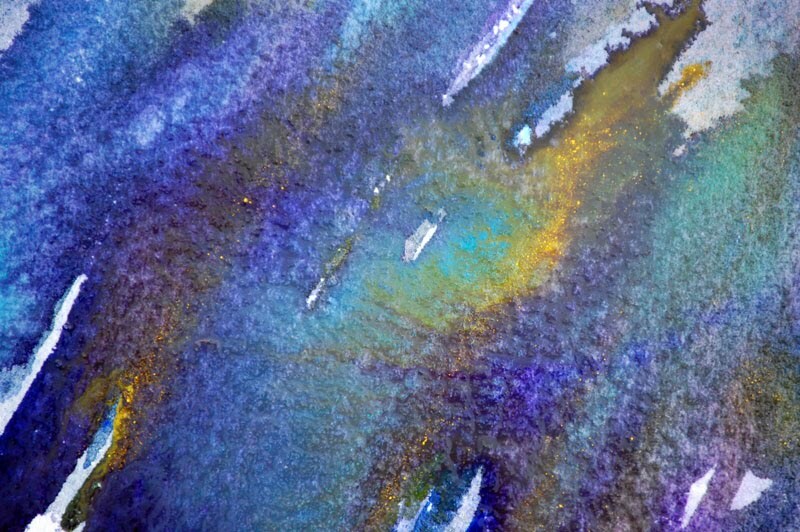 I adore capturing new or favourite subjects in a variety of explorational techniques that thrill me.The inner sense of wonder when something incredible happens in front of my eyes as colours merge and react on paper is part of my daily routine. To meet deadlines and fulfil obligations is an area that could feel like work. As a professional artist this is a full time career but on a highly enjoyable level. My creative spirit thrives on being amongst positive influences. At the moment I seem to be being asked for advise from new and upcoming artists.The best advise I can offer anyone is to always follow your own instincts and heart. Do what is right for you and paint from your heart in a way that thrills you. If you are bored when you pick up your brush you are either painting the wrong subject, maybe you have painted the same thing and in the same style for far too long or maybe you are working in the wrong medium. "Bored Artists paint boring paintings!" Maybe I am one of the lucky ones in this world of art or maybe I just happen to be in the right place at the right time.Or maybe my sheer joy in my work and the love I have for the medium is what makes things move in the right direction. All I know is at times I have to make decisions wisely just like anyone else in life. So taking time out to think is always a wise move. Today I am painting and thinking! My colour experiments are now fast becoming a part of my daily routine. 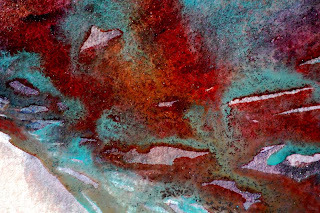 I am fascinated in what can happen between pigments and even more facsinated when water interacts to create patterns with brilliant and varied effects. These I use in my larger paintings to full effect and my journey in watercolour has never been more exciting. Just when I thought I was enjoying myself along came a new idea which took me off at a hundred miles an hour in a completly new direction. I feel as though I am at the best party imaginable with a million oufits to choose from to wear to it! It's heaven and so addictive! 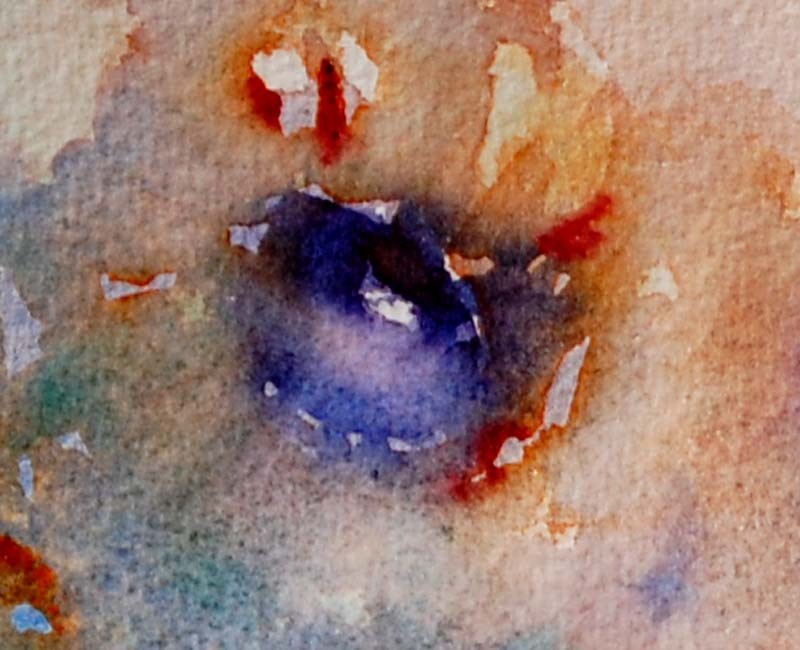 I wish everyone reading my blog a fantastic day and I hope if you are a watercolour addict as much as I am that you are having fun moving that brush. Just think, you can't get today back so make this one count! I have spent today completing a feature for an art magazine. While I worked with a selection of blue shades I realised how much fun it is to literally watch paint dry. 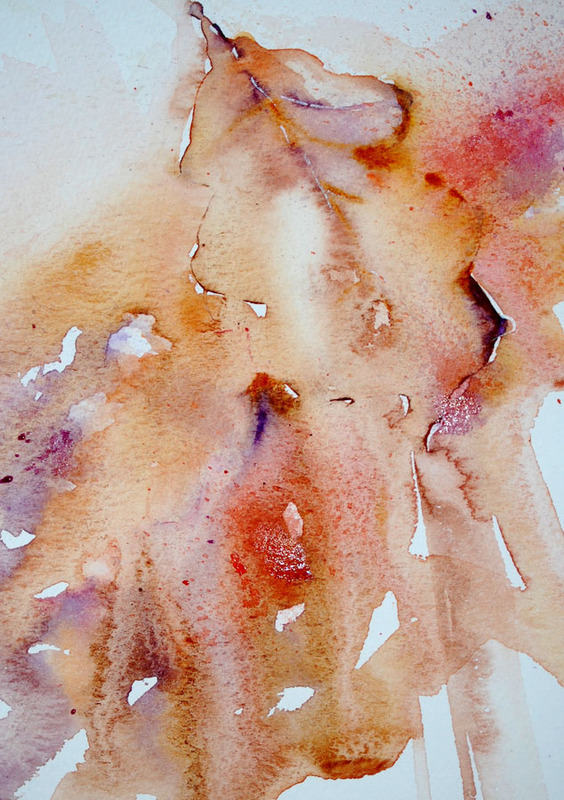 I have learned so much from sitting still and enjoying watching the pigments fuse and merge as they dry minus the use of a hairdryer to speed things up. In fact I detest the use of a hairdryer as it really can ruin gloriously natural results from allowing watercolour to dry in its own time. There is a tiny burst of pigment trying to escape in these strong bold placements of colour application.Even the "bully" Cadmium Yellow is subdued into behaving for a change! How many artists race to work on a completed masterpiece and lose vital pleasure and excitement from the joys of just playing with colour for the sake of it? Heaven forbid a day will come where I don't say " WOW!" at two pigments creating fascinating reactions as they dry. For now I must get back to writing but today has been so much fun. 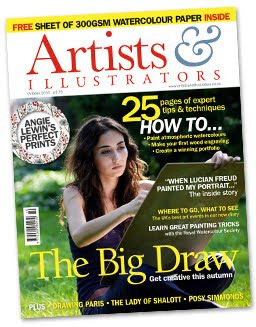 I am thrilled to be included in the Artists and Illustrators Magazine in the October 2010 issue. 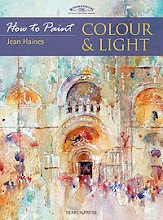 An extract from my book " How to Paint Colour and Light in Watercolour" has been selected for the masterclass series and feature. This is the first time I have been published in the Artists and Illustrators and when I read this introduction I was over the moon. 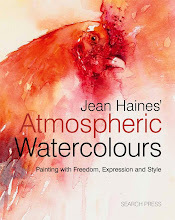 "In this months second masterclass,watercolour expert Jean haines shows how to make the most of the medium's atmospheric qualities as she builds up this colourful landscape "
What a terrific way to start a week! Following the " Meet the Artist " event at my publishers Search Press this summer I have been invited to demonstrate as a guest speaker and author at the Gardners Autumn Book Trade Show 2010 which will be held at Warwick University. It is amazing how your life changes once you start writing because now I am meeting so many wonderful authors who have written on so many other subjects other than art. So this weekend will find me sharing my passion for watercolour in a completely new way. At a book trade show and I am so looking forward to meeting everyone there. 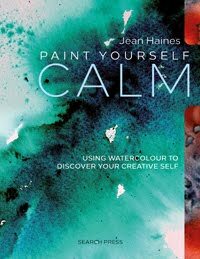 Artist and author Jean Haines has confirmed as attending. This morning I had a meeting where a discussion arose on my work being available as prints. I have avoided this area for so long because I prefer to only sell original pieces. There is something special in owning a piece that only you alone have hanging on your wall. But I do appreciate original paintings can be so expensive especially if they the artist becomes collectible so I am looking at a new series for prints that will be available in 2011. I have several projects on the go that are keeping me offline and locked in my studio including working on my next book which is coming along really well and is packed with new exciting approaches to working in watercolour. I am literally dying to share certain successful experiments that have led to really fascinating results but these will be kept until the book launch next year but I am really thrilled by them. I just wish someone had given me these ideas years ago! So today following phone calls and meetings regarding galleries, exhibtions and workshops I am back to moving my brush and applying colour in ways that thrill my artists soul. I am loving each brushstroke and my heart is beginning to sing again after losing my faithful and loving companion Taffy. I think many of us have a hole in our heart, a place that someone once filled and touched us in a way no other could. This hole I will see as treasure for all the years that were filled with love by a very special dog who started my way of painting dogs in a loose style. I will always miss him but I am grateful for having known him and loved him. Now I need to focus on upcoming exhibitions and get back to sharing as I used to. For once I am taking my own advise. My heart feels as though it has shattered into a million pieces and yet I know I have exhibitions looming which need new work. I have never had a problem when it comes to finding inspiration to pick up my brush but I always paint at my best when my heart is happy. My emotions then flow into my results and the selection of colours I use. So when I meet artists on my workshops who tell me often they find it so hard to make time to paint daily or even get into the mood to move their brushes I usually give this small tip. Every day for a short time paint one single simple thing. It doesn't matter what it is as long as your brush has moved. Just once a day. Even if it is only for five minutes. This really does effect your artistic spirit in that you will not be satisified eventually with just these small studies. 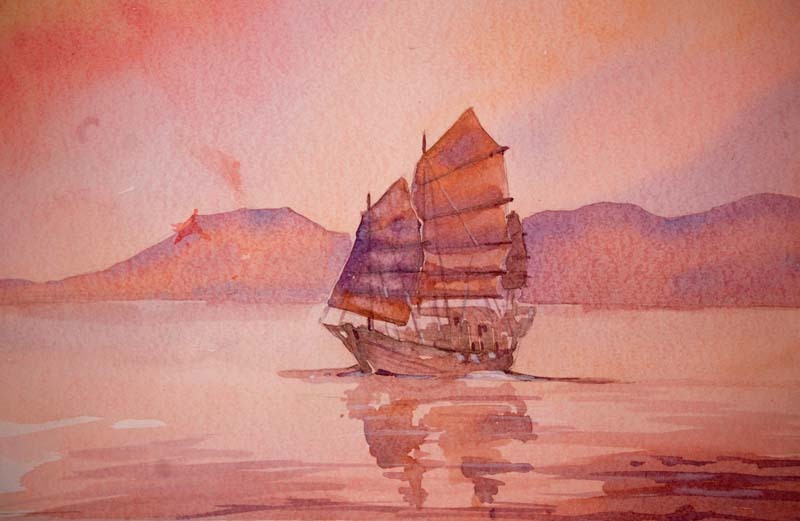 You will yearn to paint something more adventurous or complex in composition. Right now it is Autumn and I daily walk my young dog Bailey who is missing Taffy so badly. I look up at the trees changing colour in foliage and then I look down on the ground. Here I pick out patterns from the already golden leaves that have fallen and are laying underfoot. A simple oak leaf carried home to study and work out colour ideas from begins to form the base for a larger Autumn scene. My artistic soul is starting to come to life again after losing Taffy, my dear companion and pet. I will be fine in time but for now I am literally taking a "leaf" out of my own book and looking at how I painted leaves in the past compared to how I would approach them now. I dare you to find the most interesting leaf you can find and paint it from life turning it from the ordinary to the extraordinary with bold colour choices using of texture effects and brushstrokes. Painting a leaf a day could easily turn into a new addiction!
" How to Paint Colour and Light in Watercolour"
I am almost too nervous to announce I have two places that have just come available on my 27th October "Autumn Gold" Watercolour workshop which covers a variety of subjects in glorious golds and exciting techniques for texture and watercolour effects. These are the last places in 2010 on my own workshops as I will not be holding any further sessions until 2011. I would love to hold more workshops but due to exhibitions and writing my teaching time is now limited and I refuse to increase the number of artists in each session so as to maintain a high standard of enjoyment by all and allowing me time to spend personally with each individual attending. 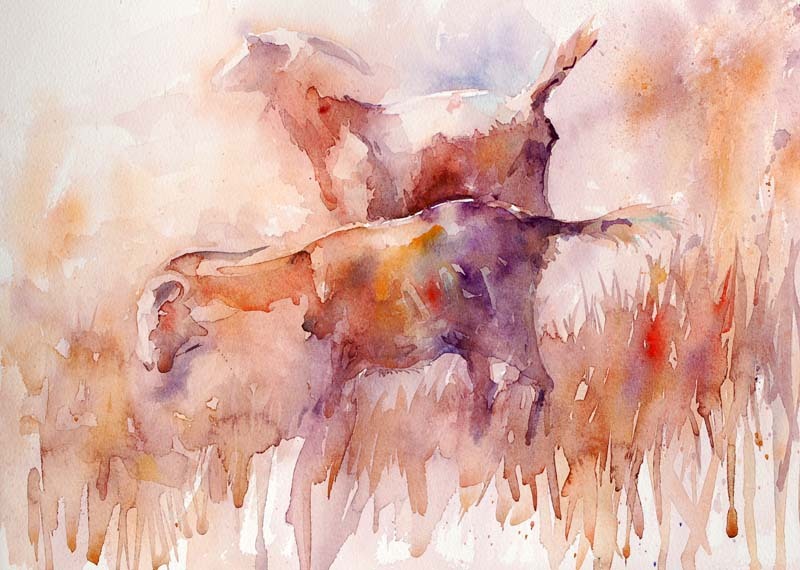 Original Watercolour from an old collection whilst living in Asia. From our recent move many boxes still remain unpacked. Even those containing art from my travels and art supplies from all the locations we have lived abroad. 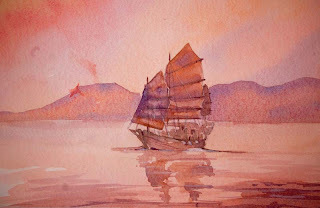 I have yet to find my Chinese materials of beautiful raw pigment stones, my collection of Chinese brushes with bamboo handles or the incredible Chinese paper and antique silk which I used to paint on. My mentor in Hong Kong came from Shanghai. For many years as an art student she was only allowed to wash the brushes of the masters who she admired. I remember her telling me how very lucky she was to be able to do so. She studied and learned from the very best of artists in their field. What she instilled in me is far more valuable than simply creating paintings. She placed in my soul the determination to really see what I wished to create long before my brush even touched the paper. Before I met her my work was wooden. There was no life or feeling in each new painting with perfectly flat washes. At that time I only painted with the knowledge of a European artists style. Flat skies with pale backgrounds and slightly darker foregrounds. All the traditional English rules flew out of the window the minute she taught me her techniques. They now seemed dull, predictable and boring. During her many lessons she would often hit the back of my hand with a bamboo stick should I even dare hold my brush in the wrong way. The discipline of learning how and where to handle a brush became absolutely vital in my work and my results today are due to this magical artists way of teaching. I don't hit anyone in my class sessions, nor do I ever tell an artist what they are doing is wrong because I do believe genuinely there is no right or wrong in how we work. But there is an artist in each of us that truly wants to create in a style that suits us. My Chinese mentor helped me find mine. I am unpacking more than boxes. I am looking at each memory as a treasured part of my life and feeling blessed to do so. But how I have changed and how the years have led me to a point where I am so excited each time I pick up my brush.It is this excitement I want so badly to share in my workshops and demonstrations. As I close my blog today I look at the painting of a junk I created whilst living in Hong Kong years ago. I understand that we can only get better if we have a starting point to improve on. I meet so many people with no confidence in their own ability because they put so much pressure on their shoulders to achieve. Giving up or feeling one will never be able to paint is a feeling that destroys the ability to improve. Having bad paintings to look at and see why or how we wish to make them better is a fantastic gift. So never look at a result that didn't thrill you as a negative. See it for what it is, a positive to learn from because we learn more from paintings we don't like than from those we do! 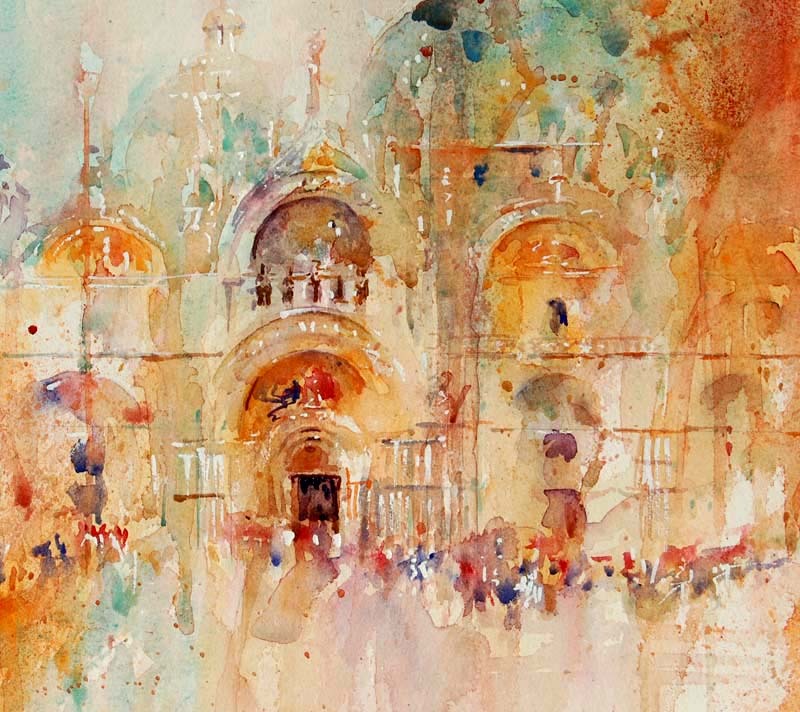 Many professional artists frequently receive requests to demonstrate or hold workshops for art societies worldwide. For me this is a wonderful way to meet other artists whilst sharing my own art journey and techniques. Last night I was delighted to meet the members of Sunningdale Art Society. I will confess yesterday afternoon I was so concerned I would be able to pull the evening off because my heart is still very low from losing my wonderful companion Taffy last Friday. A week today. The meetings for Sunningdale Art Society are held in a wonderful venue and the room was already arranged on my arrival so all I had to do was set up. I was met by the fantastic programme secretary, Steve Darnley and given a really warm welcome. Steve if you are reading this I did get home safely! Everyone arrived and as always I faced a sea of new faces. In turn they all faced me. 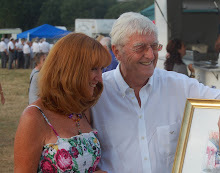 For those of us who have attended many evenings held by art societies over the years we never truly know what the evening is going to be like unless we know the artist who is demonstrating. Some such evenings are wonderful and some can be very "not so wonderful". Have you ever sat watching someones back for over an hour? It isn't fun! Especially when you are unable to see what they are painting or even hear what they are saying. Has time passed so slowly you can't wait for the evening to be over so you can make your way home? Sadly I do know that feeling and I would hate for anyone to watch me and feel the same way. I have even been to demonstrations where everyone viewing actually reaches a point where they feel like nodding off so my approach to these evenings is possibly a little different. I share my enthusiasm and passion for my chosen medium. I celebrate what it can do and work with each effect thoroughly enjoying what happens with each touch of the brush. Sharing my experiences from studying under my Chinese mentor really does help to get across how I use my brush. I love watercolour and I love sharing the joy I feel when working with it. There is always so much I want to share but time often limits what one can and cannot get across. Last night we had fun looking at several subjects and ways to capture them in a loose style. There was a brilliant mix of laughter, enthusiasm and quiet concentration throughout the evening from everyone in the room including myself. 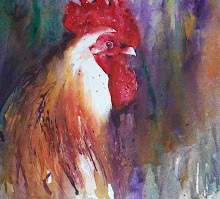 I started with a simple warm up followed by a second demo of a cockerel. This led to the break when I had the chance to talk to individual members all of whom were absolutely fantastic and I had time to sign books also. After the break time flew by and my final demo came to a close. Only at this point did I explain to the room why I had chosen not to demonstrate painting a dog. 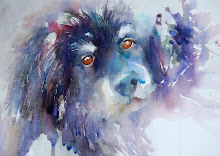 The art society information described me ahead of my booking as a guest artist who specialised in painting animals and mentioned I had written a series on how to paint dogs in a loose style for the SAA magazine. And yes when the evening was booked I had considered demonstrating a lovely study of a fabulous dog in a beautiful pose for the nights session. .But friends will know standing in front of a crowded room and talking about wet noses and glowing eyes full of love would have been far too painful for me at the moment. 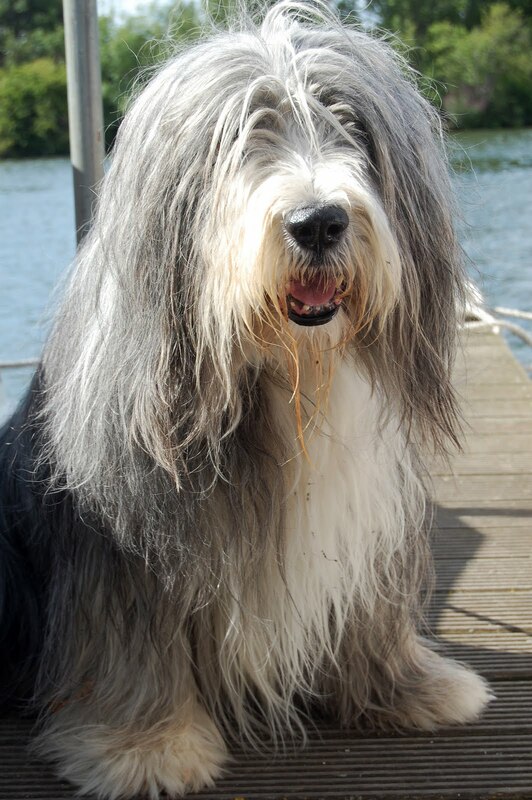 So close to having lost my dear friend,model and guardian Taffy. Instead I chose a variety of subjects covering my techniques and I was thrilled to recieve such a positive and excited feedback from so many fascinating members who took time to say thank you for my visit. We are SO lucky to be able to share passion and interest in art because our paths constnatly cross with others who are loving every second of their own art journey.Together we enrich this world with our enthusiasm and positive energy that is almost tangible when like minded souls are in one room. Thank you Sunningdale Art Society for such a warm welcome and enthusiastic response last night. I truly hope to meet you all again in the future and in the meantime I definitely hope you are thinking just how you will be moving your brushes and what subjects you will be painting and why very soon ! 2011 Watercolour Workshops information will be announced in October. 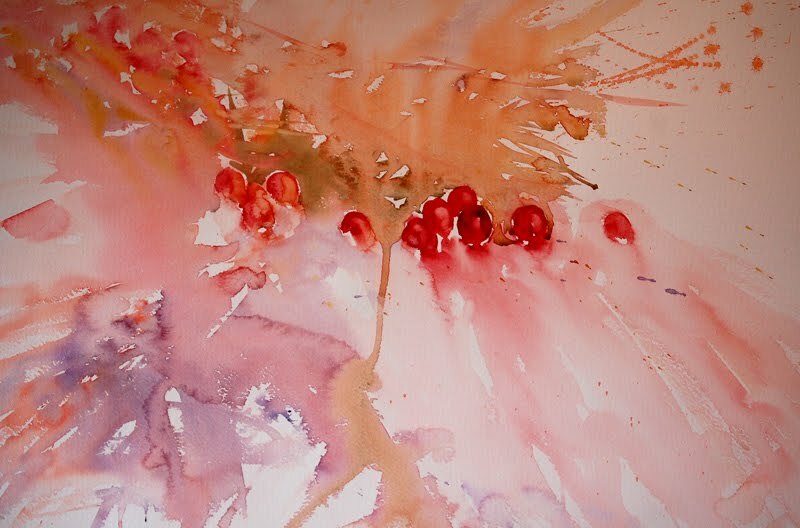 Hawthorn Berries emerging from an Autumn Wash.
Last week saw the first of my 2010 Autumn Workshops and as always I met some absolutely wonderful artists on them. 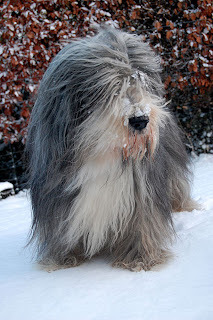 Normally I would have been on my blog long before now to share news of the week but as everyone knows I lost my best friend of many years and faithful pet Taffy which truly has knocked me sideways. Thank you to everyone who came to the sessions and I am thrilled with all the incredible messages letting me know how inspirational they have been. I hope everyone is looking daily at subjects with new eyes and even seeing new unexpected subjects and gorgeous ways to paint them. Please remember these words. Dare to be unique, different and unusual because what has been done already in the past artwise really has already been done. Be you and let your own creativity shine in ways you have never allowed yourself to shine before and I will eagerly wait to see what you create from here in. 2011 Watercolour Workshops will be posted on my blog and web site soon. I may hold a special "Painting Dogs in a Loose Style" workshop in memory of Taffy. Thank you so much to everyone for all the kind,warm and supportive messages regarding the loss of sweet Taffy who passed away last Friday. I feel shell shocked and as if my right arm is missing. He was constantly by my side. I am used to hearing his loud snoring which interrupted many a movie at the crucial parts. At seven on the dot every evening Taffy would not allow you to rest until you had given him his goody. A chewy stick which became part of our daily routines for the years we had him. He didn't mind who gave it to him but he had to have it every single night. He had a way of sitting and staring at you until you gave in and went to find one from the goody cupboard. Only then would you have peace. In life we all face changes constantly but nothing prepares you for that sense of loss when you lose something or someone you love. We have had many pets but only one travelled all over the world with us as Taffy did. Many artists loved him from Dubai and Hong Kong to many the locations we lived throughout Europe. He herded sheep in France, followed us with the ground crew while we were in a hot air balloon in Switzerland, came face to face with camels in the desert of Dubai and loved eating rice in China. So a huge part of my life was connected with this very dear old boy and he was a perfect gentleman. His only vice was that he adored blondes and flirted with them outrageously in ways that some male dogs do at times. Often creating embarrassment and laughter at the same time when he did. And so I am finding myself back to painting in my studio minus having him around and it does feel very strange. Bailey our younger Bearded Collie has not eaten properly since last Friday so my concerns and time have been spent with him. Time heals broken hearts and as much as I have been advised to I will not be getting a puppy just yet. I miss Taffy too much and it wouldn't be fair on a youngster to only have a small part of me when they deserve more than that. I have been touched by so many cards and beautiful messages. Far too many to thank personally but I do thank you, so very much for reaching out to me. Each one has brought another tear but helped to let me know I have friends out there who understand and care. To the wonderful ex officer, your email reached me and made me aware that my blog is being read by those who don't know me well. I read each word and knew I needed to come online and explain what is happening and let everyone know I am fine. Just grieving for a lovely friend. Thank you for taking the time to write to a stranger. Often we never know how our kindness helps another. My beautiful model, best friend,painting companion and gentlest of giants fell asleep in my arms for the very last time this afternoon. My heart is breaking even though I knew each extra day with him has been a blessing for so long. And right now I can hardly see the screen for tears. In a typical Taffy style of always putting me first he waited until all my workshops were over before he finally gave in and lost his fight. He has been so very brave and absolutely determined not to leave us. His spirit has been so strong but today saw a change. On the way home from his short morning walk he lay down unable to get up. I sat with him until he regained his breath but a second spell of laying down indicated he was very weak from his aneamia. He had just been in a field sat looking around him enjoying nature in sunshine. But now he was home and even weaker. I lay down beside him with his huge gentle head in my arms, stroking him and talking to him as he shared his last precious moments with me. I found myself burying my face in his soft fur and absorbing every detail knowing I was about to lose him. My heart was torn into a million pieces as I whispered favourite loving endearments which I knew for the last time. I will miss him nudging my arm when he thinks I have been painting or ignoring him for too long. I will even miss his incredibly noisy snoring and the soft noise of the thump of his tail when he dreams in his sleep. Book Signing and Exhibition Preview Tonight. Yesterday was another wonderful day with a workshop full of fascinating artists of all levels. I hope everyone in the room enjoyed the session as much as I did. I even started the day by going for a walk near to where I would be teaching finding "treasure" from the local countryside to use as subjects to work from. In the evening I made my way to THE FRAME gallery in Odiham as my new collection had just arrived. There are favourite pieces as always in gorgeous frames that I now would love to keep. A beautiful poppy full of watercolour fusions is one of my main favourites. The landscape from my book is in gorgeous golds and I know I will never be able to repeat the effects in it. 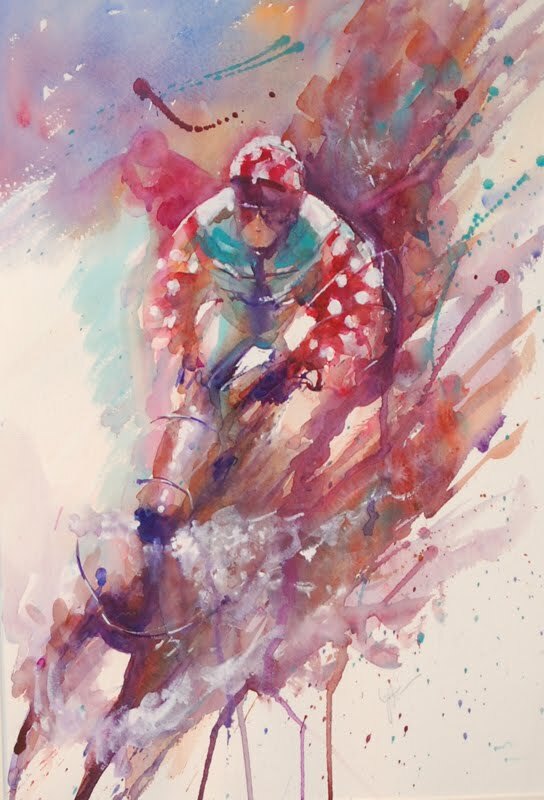 And as you walk through the door a jockey is hurtling towards you at top speed leading a very exciting race.Over his shoulder you can almost see a jockey in the distance desperately making a bid to catch up but he won't make it, or will he? This is in a stunning frame that sets off the piece so brilliantly. A sense of movement makes this painting come alive in a way that makes me want to race for my brush again. It has that special spark of magic in it. This morning I leave for my last workshop of the week on subjects connected with Autumn.We will be looking at so many ways to capture the sessence of this time of year and I can't wait. Before I leave I need to talk to a reporter from the local press. 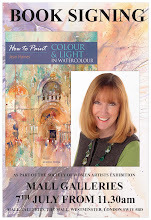 Immediately after todays workshop I will be heading to the preview and book signing at the gallery. I am not sure how or when my life changed to this form of lifestyle where I am constantly heading from workshop to demonstration to gallery. It really just crept up one me. In between I am writing and painting from my heart. I wouldn't change a thing but how amazing our lives can change so dramatically as if in a heartbeat just from doing what we love. See you tonight at the book signing if you can come! Dear Chris, you asked a question over lunch at the workshop yesterday? The answer is today 7.30 a.m. after a morning walk! To everyone who has been on my workshops this week a huge thank you for being so fantastic and making each day incredible. Laughter flying around the room at times, quiet concentration studying subjects with eager enthusiasm in every brushstroke is just the most amazing "high" isn't it? Happy painting! I will reply to my comments soon but this week is extra busy!